The unique geometric design gives a modern twist to this 14k white gold engagement ring. Fine and fashionable, this attractive ring has a matching wedding band to complete this gorgeous look. Sure to please the someone special in your life! 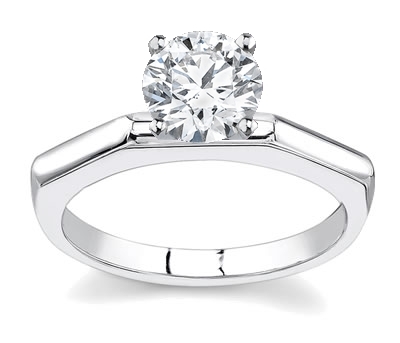 The center stone is a cut 0.25ct brilliant round diamond. The original GIA certificate is also included. We take great care in choosing the perfect diamond to fit within your budget. These diamonds have been selected for their quality and exceptional price. All of these diamonds come with their original certification.